How to use the new HTML5 tags to produce more semantic and useful markup. HTML5 added several new functional and semantic tags. The new semantic tags were added because the old HTML4 standard basically assumed that each page was a single entity about a single topic. In the real world, that's just not true so it makes sense to divvy up the page according to which sections and pieces of it mean different things. This is useful to you the developer because it allows you to write markup for subsections of the page independently from the enclosing document (allowing easy re-use). It's useful to users with accessibility needs and search engines because it helps them parse the meaning of each part of the page more effectively. 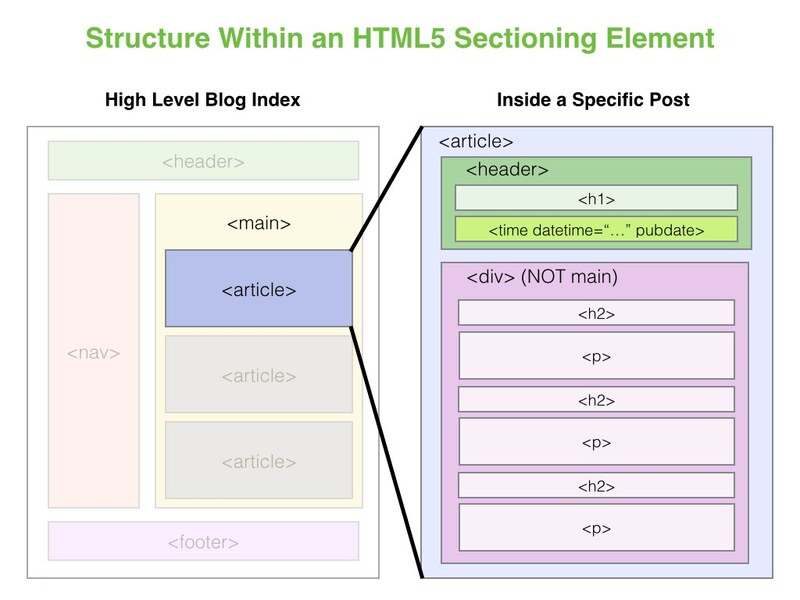 In this lesson, we'll cover the new sectioning elements and other semantic tags provided by HTML5. Though it may seem a bit unnecessary now to use these in place of traditional tags, building good semantic pages is part and parcel of being a professional developer. Semantic tags are essentially just <div> elements that wrap particular types of content on the page. They are not required but help the browser, assistive devices, and search engines determine what the structural outline of the page actually looks like. Using the following elements well will force you to think more logically about exactly what kinds of information are being displayed and where. Sectioning Elements are a specific category of semantic tags, like the original <body> tag, which define discrete new Sections of your page. Each of them helps create a new "node" in the document outline created by the browser, and sort of acts like a nested document-within-the-document. A real-world example would be the Sports or Entertainment sections of a newspaper. In the newspaper example, an <article> would, of course, define an article. Each article is self-contained and might be re-published on its own. Sometimes comments are also considered <article>'s when they can be republished independently. A major navigation grouping of links on the page. Often the main navbar or nav grouping. Essentially, wherever you'd be tempted to write <div class="nav">. Content that's tangential to the current flow, like what would normally be "pulled aside" and styled differently, e.g. a "Did you know?" box or an advertisement. It's considered "outside the content flow", which is why it gets treated separately. Because they're relatively new, it's worth clarifying a few useful points about sectioning your page. Ready to go cross-eyed? You can potentially have a <section> wrap an <article> which contains multiple <section>'s of its own and that's fine (think back to the newspaper analogy above -- a long article might have subsections too!). You might even put <section>s within a <nav>. The point is that tags defining new semantic areas of the page might naturally nest within each other in different ways, so don't let that bother you unless you're losing track of them. According to the spec, you should also have a proper heading hierarchy (e.g. <h1>, <h2>...) within each of the above-mentioned content-section tags. This helps search engines properly index the content of your page. Without being able to do this, your page's main <h1> is just assumed to represent the full contents of the page, whether that's the case or not (e.g. "The World's Greatest Blog" above doesn't represent the contents of the posts in any way). You should, therefore, according to the spec, always have a "main" <h1> for the document and then one immediately atop each <article>, <section>, etc to define its label (if it has one). 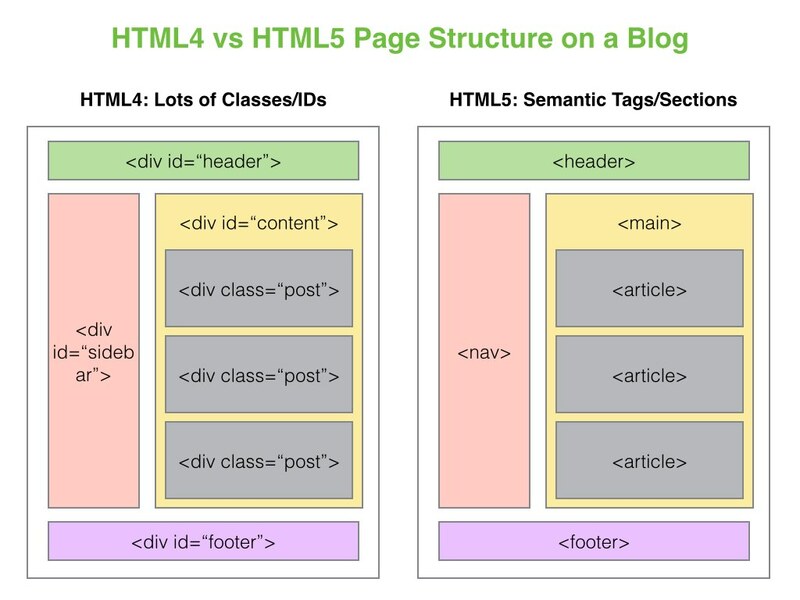 The HTML5 specifications suggest that you can use h1 elements at the start of each section, which would become a sub-heading of anything preceding that section (so, in the example above, if you had an h1 immediately following the opening article tag, an h1 immediately after an opening section tag would be a sub-heading of that initial h1). This screws backward compatibility, however, and any user agents (including screen readers) that don’t understand this won’t apply properly structured heading levels. We suggest sticking to the headings levels you would use if you didn’t use sections (so h1, followed by h2, etc, regardless of the sectioning). This doesn’t break anything or detract from the meaning or semantics. So, for now, stick with a traditional hierarchy if you need to support legacy user agents. In this program, it's okay to use either. As time goes on, legacy support will become less of an issue and the new standard will prevail. As another point of clarification, when should you use these sectioning tags instead of a <div>? Well, <div>s are not semantic, meaning that you can use them when you just want to style a group of things together whose content may or may not be related. The sectioning tags are semantic, so you're meant to use them only when the content they wrap fits under their use case. The following tags do not define new sections on the page (so shouldn't have their own heading tag hierarchy within them) and can be thought of as assistive. This is just an abbreviated list of the ones which you'll most likely encounter. This defines the page's main content. It shouldn't be enclosed in any of the sectioning tags except the page's <body> tag. It should not contain anything that's repeated elsewhere across your sites like navigation or the main footer. There should only be one <main> tag on each page (so sections shouldn't use it). A group of introductory or navigational aids, and might include your section's <h1> and <h2> tags as well as a table of contents for the page or an article within it. The footer for the nearest Content-Section. Essentially, use this where you'd be tempted to write <div id="footer">. An exact timestamp or precise date. The "pubdate" flag tells search engines and others that this is the official publication date for this section (or the whole document if there is no enclosing section). The datetime attribute can be formatted either as just a date ("2009-10-22" or with a timestamp as well "2009-10-22T13:59:47-04:00"). The contextually-relevant address related to a piece of content. Often the contact information for the author of an article and placed within its footer. Does NOT need to be a physical address. An inline section of text that should be highlighted or "marked up" for reference purposes. A figure or diagram which accompanies the normal content. You can actually make up your own elements if you really want to -- browsers will just treat them as being inline by default. Note: You might see the hgroup element around... it's been removed from the HTML5 spec so don't use it. # The main content of a page. Only one per page! Think about how you might use the new semantic tags to wrap something like the blog page used in the example from before. What is the <nav>? How would you potentially define new <article>s or <section>s? What might go in the <footer> or <header>of an individual article? It can take a bit of practice to remember when it's a good idea to use a semantic tag instead of a normal <div>. To start out, try just sticking with the most obvious tags like <main>, <header> and <section>. Feel free to come back to the diagram here if you need some help in the future.